Signature Bank of Georgia Expands With a Loan Production Office in Gwinnett County | Locally owned and operated community headquartered in Sandy Springs, Georgia. SANDY SPRINGS, Ga., October 29, 2018	(Newswire.com) - Signature Bank of Georgia President & CEO Freddie Deutsch announces the opening of a Loan Production Office at 1186 Satellite Blvd. Suite 100 in Suwanee, Georgia. The opening of this office is a key part of the bank’s growth initiatives which result from the successful 9.5 million dollar capital raise announced earlier in 2018. Steve Reagin, Chief Lending Officer and a long-time resident of Gwinnett County, is excited about bringing Signature Bank’s unique way of doing business to Gwinnett County. “While it won’t be a full-service banking center, it will allow our team of talented bankers to capitalize on the unprecedented market disruption of nine Metro Atlanta community bank’s being acquired since 2017. Additionally, we will be more convenient to the business community, which continues to benefit from a strong economy, enabling Gwinnett County and surrounding areas to experience significant growth,” says Reagin. One of the few remaining locally owned and operated community banks in the Atlanta area, Signature Bank is headquartered in Sandy Springs. A unique aspect of Signature Bank includes the decision makers living and working in metro Atlanta. Clients seeking financial partners will find the experienced team at Signature Bank to be strongly focused on creating a high-touch, high-service experience referred to as “boutique-banking.” Clients wanting a relationship with their banker and expecting easy access will receive it. 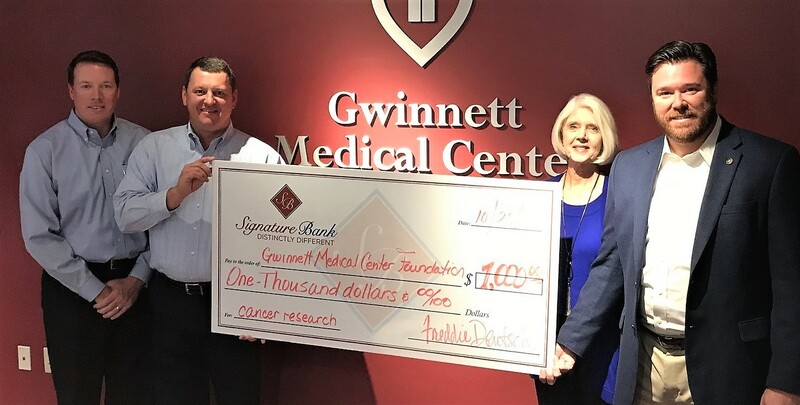 Signature is proud to be a contributing member of the Gwinnett community as evidenced by a recent donation to the Gwinnett Medical Center Foundation. Pictured l - r: Daniel Baker & Steve Reagin with Signature Bank and Linda Storey and Jason Chandler with Gwinnett Medical Center Foundation. Also, a new Gwinnett County Chamber member, plans for a ribbon-cutting and open house will be announced soon. The office is expected to officially open on November 1.